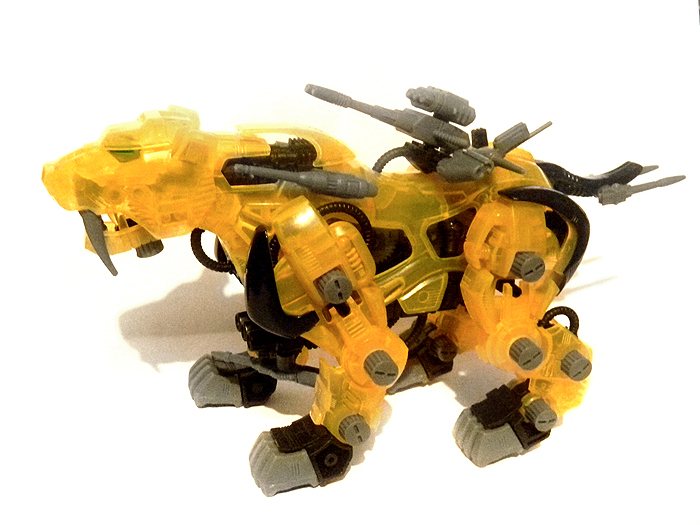 Zaber Fang Holotech is one of several exclusive Hasbro Zoids, sporting a transparent plastic that was dubbed the "holotech". 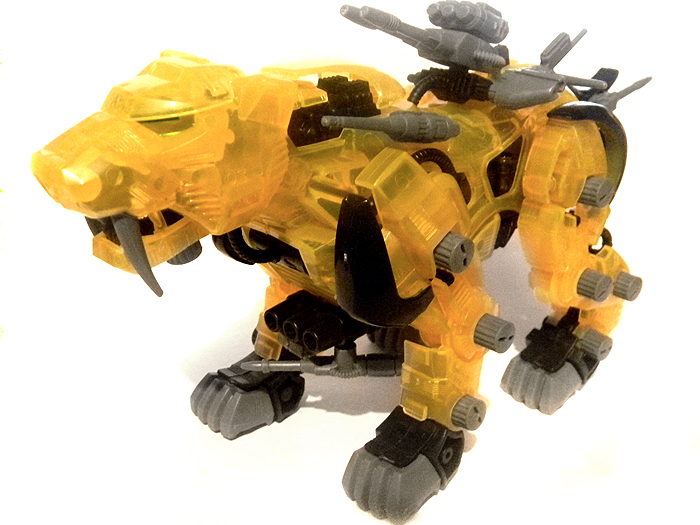 It is unique in the Zaber Fang line for that very reason. 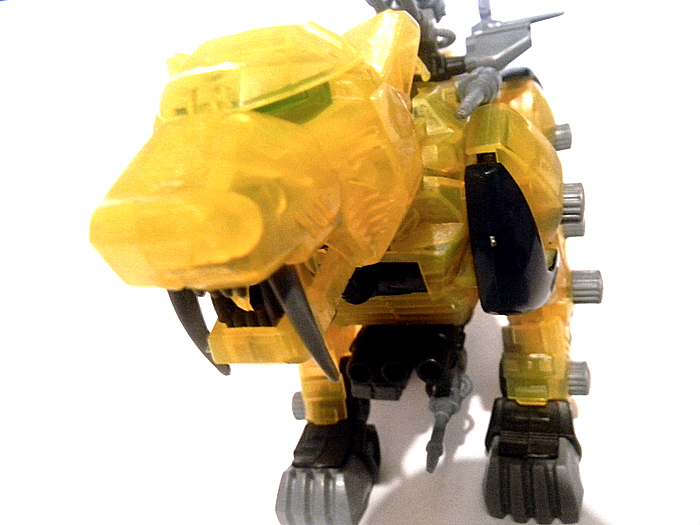 Aside from the color, like other Hasbro tigers, it uses the name "Zaber Fang" in place of "Saber Tiger". 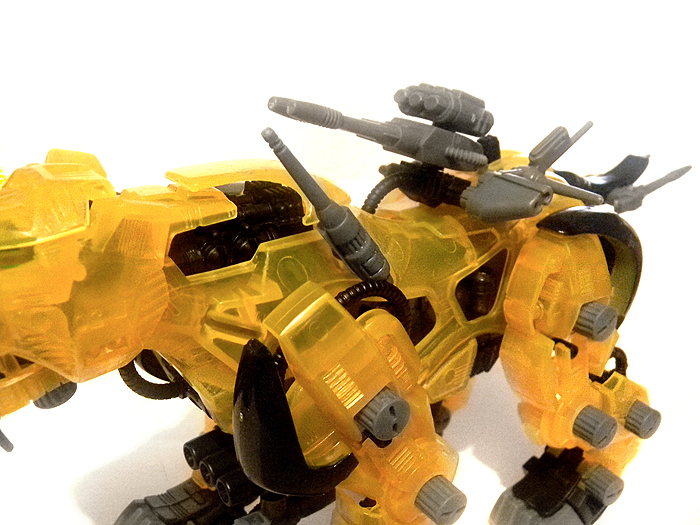 The colors of the tiger are a bit strange, given they're also the same (general) color as the solid-plastic Zaber Fang, also released by Hasbro. 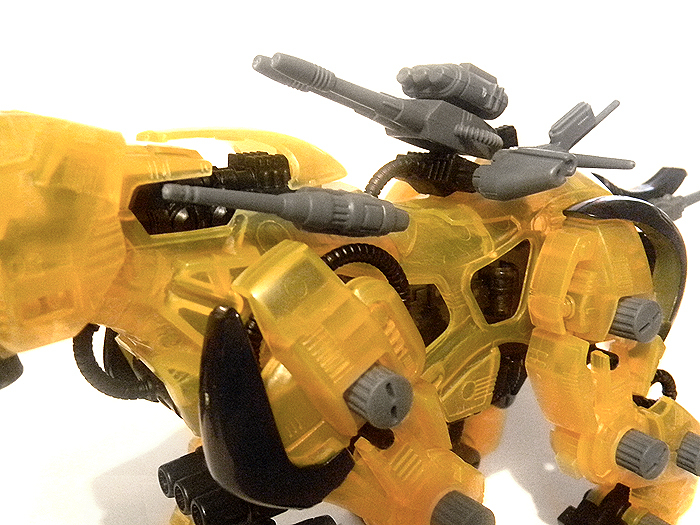 With a more goldenrod shade, the Holotech can create some pretty awesome effects when placed infront of lights. 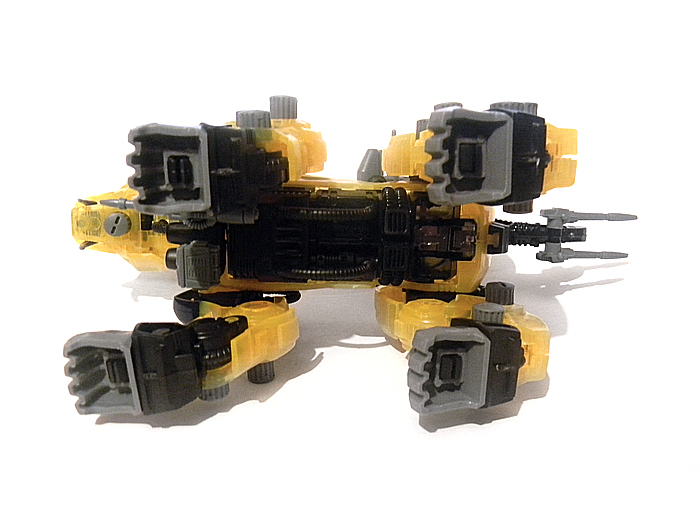 Even so, the black undercoat of the Zaber Fang make a lot of the thinner pieces appear green-ish. 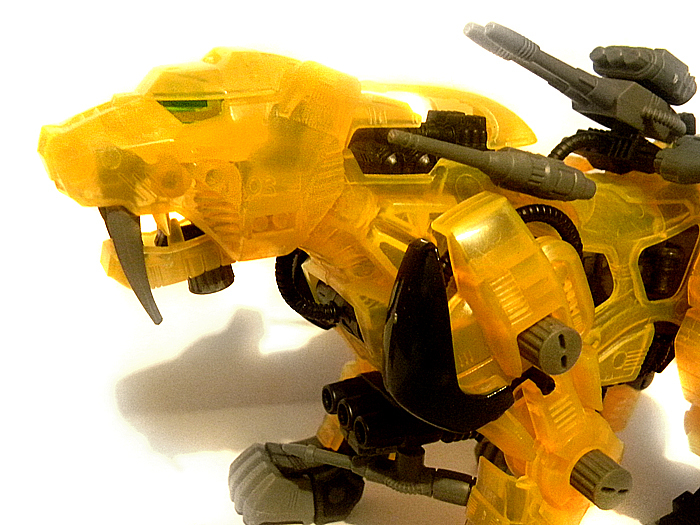 There aren't many complaints about this Zoid. Zaber Fangs in general tend to stand a little wobbly, but this is common in motorized quadrupeds. 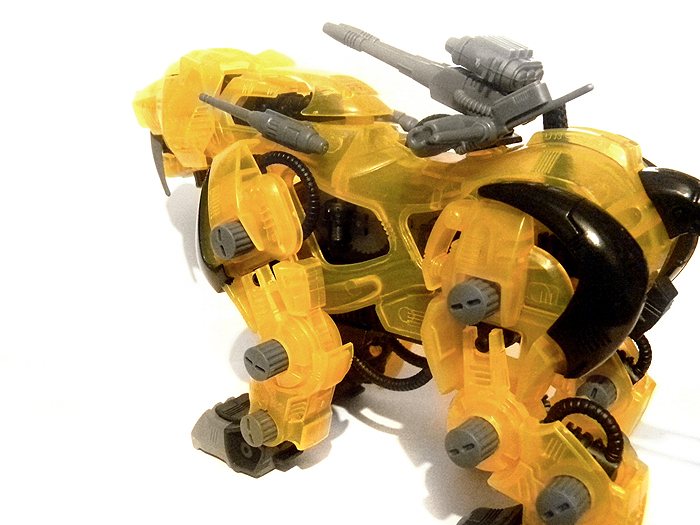 It's a great zoid, great build, and has a lot of cool weapons. 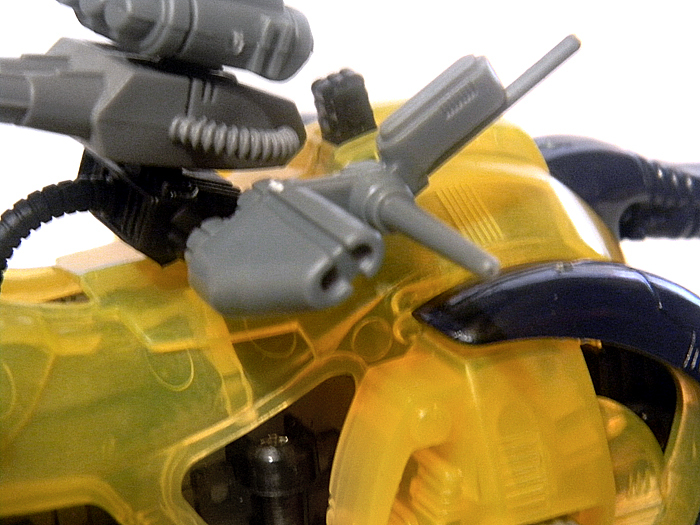 You may notice that the Hasbro varients also have blunt fangs. Zaber Fang's eyes are attached to the cockpit. 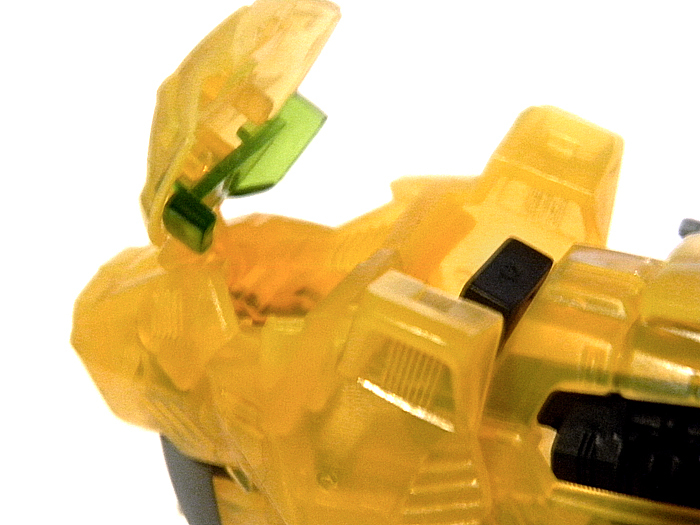 I'm not sure why, but this looks nice when the top of the head is opened up. The pilot sits loose in the pilot seat, but mine was off somewhere else during the photos shoot. 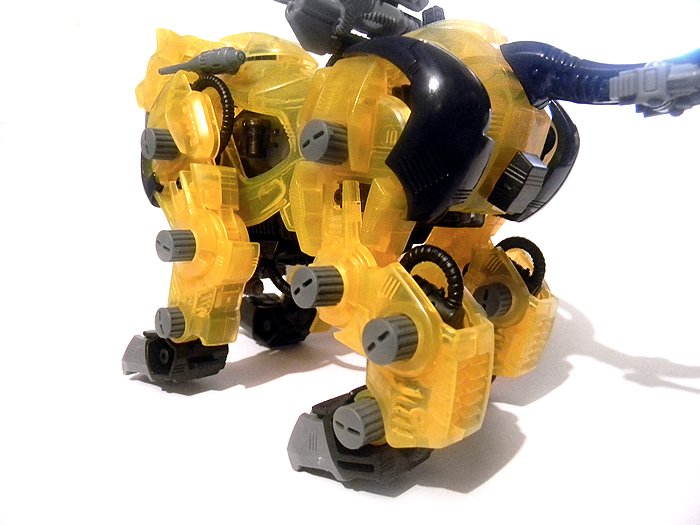 Zaber Fang has two single-barreled laser guns on either side of it's back. These can rotate quite a ways, but are a little difficult to get on all of the way. 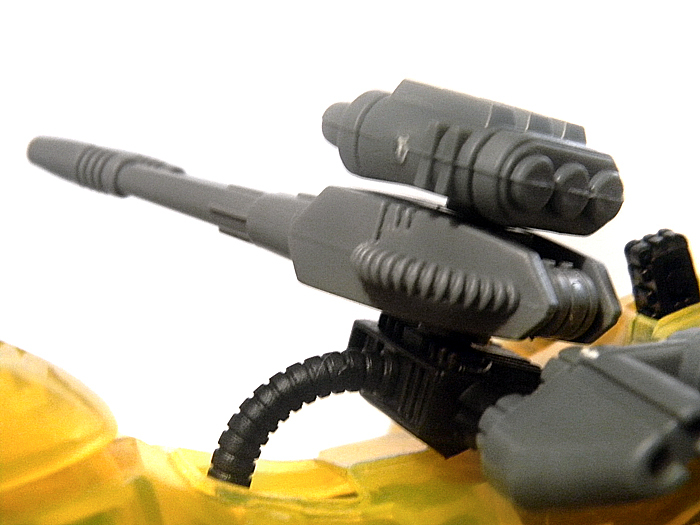 Two weapons are put onto the chest guns of the Holotech. One is another single-barrel gun and one is a box. Both can rotate, though the box's shape makes it a little less adjustable. 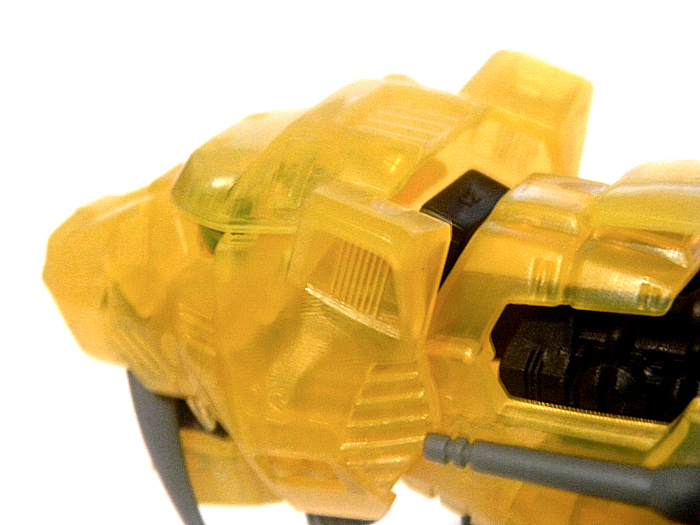 Likewise, the energy gun is too long to be able to fully rotate due to the left leg. 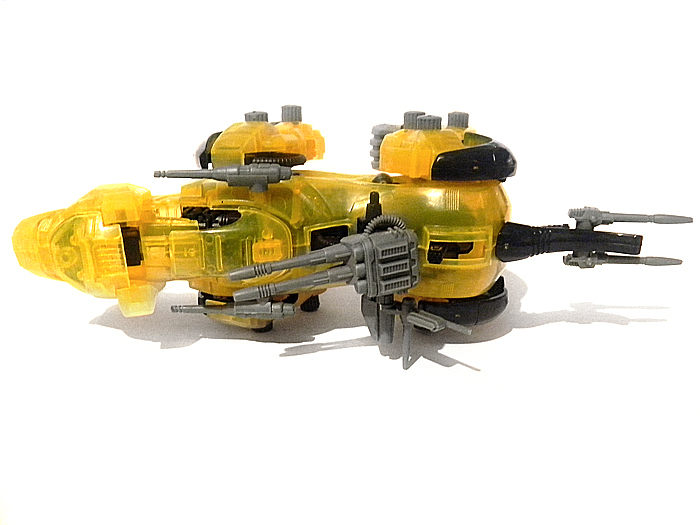 Both guns on the tail rotate. Unfortunately, I forgot to get good pictures, but the back unit includes both a side radar (thing?) 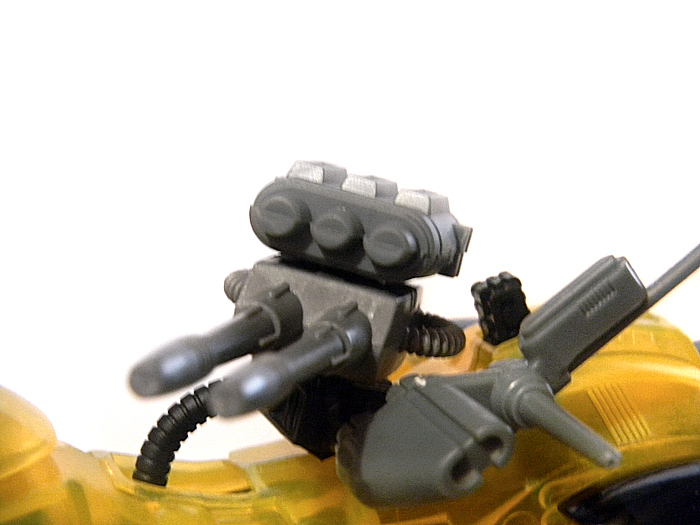 and a double-barreled gun on the top. These can both rotate. 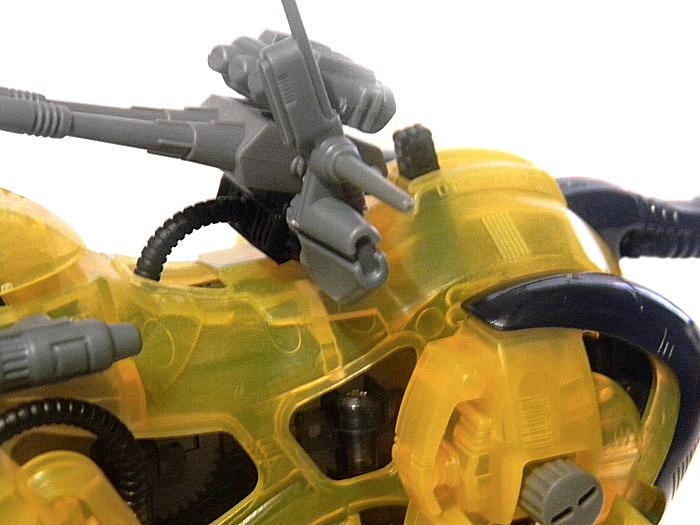 The radar antenna rotates forwards and backwards, and the top gun can swivel around to just about any direction.